Claiming a bundled SharpCap Pro License – SharpCap – Lunar, Planetary, Solar and Deep Sky Imaging. EAA and Live Stacking. Some cameras are sold with a 1-year SharpCap Pro license included with the camera. If you have purchased one of these cameras then follow the steps below to claim the license. Ensure you are connected to the internet – the license claim procedure requires a working internet connection. Run SharpCap. If you do not have a SharpCap Pro license already, then a notification should appear at the top of the screen soon after SharpCap starts. In the license claim window, enter your email address. Take care to enter your email address correctly, as you will receive a copy of your license by email. 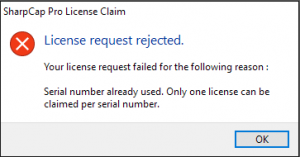 Press the Claim SharpCap Pro License button – after a few moments your claim will be processed and you should see a message confirming the license claim has been successful. Your license email should usually arrive within a few minutes. If you do not see the notification about claiming your license then please check that your camera is being detected correctly by SharpCap – if SharpCap has not detected your camera then it cannot offer you the opportunity to claim the license. 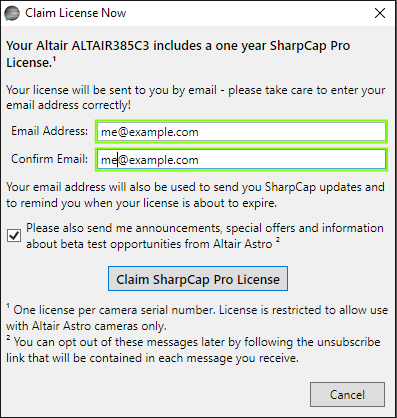 If you have any other questions about SharpCap Pro Licenses, please check the FAQ. Note: You can choose to share your email address with the camera manufacturer to receive updates and special offers if you want (this is entirely optional – if you choose not to share your email address with the manufacturer then your email address will only be used to send you your licence key and remind you when it is about to expire).